This is an executive PG Program in Aviation Management designed for professional who need focused program in Aviation sector specialization. It’s a 10 months program meant for professionals moving into mid or senior management roles in Aviation, Airlines, Travel Portal / E-Commerce, Oil and Gas, Hospitality, IT Industry and other related industries, in both India and Abroad. UPES is the best known University for Aviation programs in India. It started with Oil and Gas programs in 2003 before launching other domains. We are considered a premium University by corporates in Oil & Gas, Energy, Shipping, Logistics and related sectors. Our students are working with some of best known corporates both in India and as well Abroad. 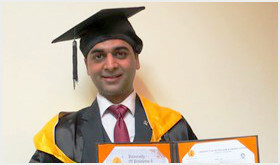 MBA in Aviation Management from UPES Dehradun has been a fantastic experience. Previously I finished my Bachelors of Science in Aviation studies from UPES itself. It has been a very enriching experience & the program was well designed to cover all crucial aspects of aviation Industry that is paramount for development of management companies along with domain knowledge.